Prepare yourselves well for the semesters ahead! Canvas is Singapore University of Social Sciences (SUSS) adopted Learning Management System. It is used to access course related materials and announcements, participate in online discussions and quizzes, submit written assignments and download marked assignments. In addition, Canvas is where you can retrieve your assessments scores. We have organised briefing sessions during the orientation day to help you get started quickly with the use of the Canvas LMS. It would be prudent for you to spend your valuable time attending this briefing instead of struggling with the technical know-hows of the LMS later. As a student, you should focus on your learning and validate that through your assessments. 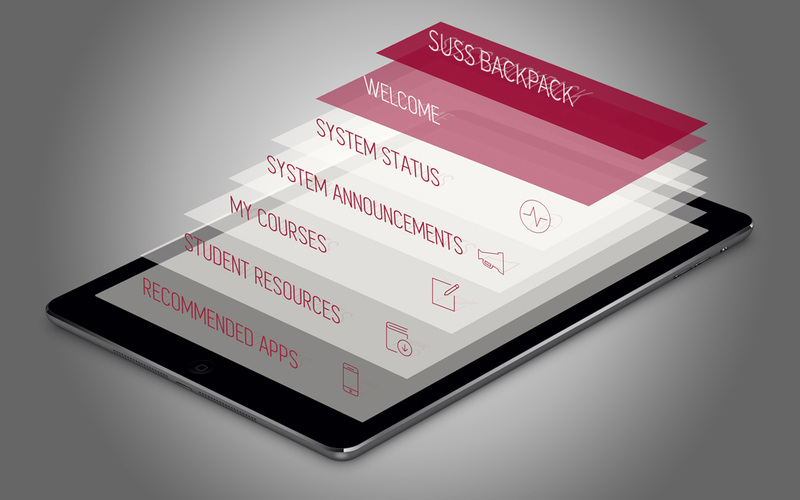 SUSS Backpack is a mobile app that enables students and faculty quick access to their class timetable, iStudyGuides, eTextbook, recorded lectures, narrated presentation materials and past year exam papers. It comes installed with useful student resources such as academic writing and essential learning skills to help our students enhance their learning experience in SUSS. This mobile app lets students check their Cumulative Grade Point Average (CGPA) scores and records in-class attendance using iBeacon Bluetooth technology. It also broadcasts important notifications from the university instantaneously to their mobile devices. With this app, students can contact support staff for technical enquiries and even find their way around campus using the interactive navigation map. The app also integrates with Canvas Learning Management System with quick access to course announcements and assignment due dates. The Interactive Study Guide (iStudyGuide) contains detailed information on the course structure including the course overview, learning outcomes, assessment components, subject matter, as well as course introductory video, chunked lesson recordings, audio clips, formative assessments with feedback and more. It is designed to encourage students to interact with the subject through quizzes, activities, self-reflection and self-assessment. The content in the iStudyGuide is broken into bite-sized topics and organized into study units to be covered over the course of study. It enables students to learn at their own pace anytime, anywhere, even without network connectivity. It is accessible on multiple devices (i.e. desktop, laptop, tablet and smartphone) and across various operating systems (i.e. iOS, Android, Windows & Mac). The eTextbook is an electronic version of the physical textbook, which can be accessed from different devices (desktop, laptop, tablet and smartphone) and across various operating systems (iOS, Android, Windows and Mac). As a downloadable resource, it enables students to learn anytime, anywhere even when there is no network connectivity. In addition, the eTextbook is developed with interactive features that allow students to search for content using keywords, create highlights, take notes and share them with peers. With the prevalent use of smartphones and the increasing number of users reading from their mobile devices, the eTextbook is one of the many initiatives that SUSS has adopted to make learning more flexible and socially engaging. This video will show tips on how to use Bookshelf, the process of reading, studying, and interacting with your eTextbook. Search function inside of your eTextbook allows you to search for information using keywords found in your eTextbook for your assignment or to do research. It is useful for you to highlight important concepts or information for easy retrieval. While notes taking function allows you to summarise or write your own reflection of the different sections in the eTextbook. This is useful when you want to share notes or questions with your classmates or instructors. This allows you to easily copy content of your eTextbook that you might need in your note-taking or assignment preparation.